RapidRun is known for its versatility, convenience and ease of installation, however, even the most experienced installers will run into hazards that damage or kink the cable during installation. Problems associated with installation damage are seldom found until the final phase of the installation when the cable is already enclosed in the wall. Color-coded orange for use with RapidRun Multi-Format runners, this test adapter allows for a continuity test of the Multi-Format runner to ensure proper functionality before leaving the job site. 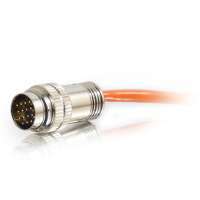 This test adapter includes two pieces: a modified RapidRun connector that connects to the display end of the runner, and an RJ45 adapter cable that connects to source end of the runner and to the input of a common network cable tester. Please see our selection of network cable testers. Connect the modified RapidRun connector to the display end of the Multi-Format runner cable. Connect the RJ45 adapter cable to the source end of the Multi-Format runner cable. 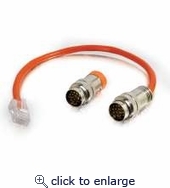 Connect a network tester to the RJ45 adapter cable. Run a continuity test with the network tester.